The Victory Project’s premier fundraising event for BCA-CV. “Enchanted Masquerade: Fantasy Comes to Life” encompasses the event’s spirit of dressing up and getting out and about in the community together. We are excited to fill the town with fun, raising money and awareness for individuals and businesses to help Breast Cancer Awareness-CV. Dresses, masks, wigs, hats and more. We will once again be lining the streets with lights, red carpets, step and repeats and paparazzi to capture the Glamour and Fantasy that attendees are sure to bring! 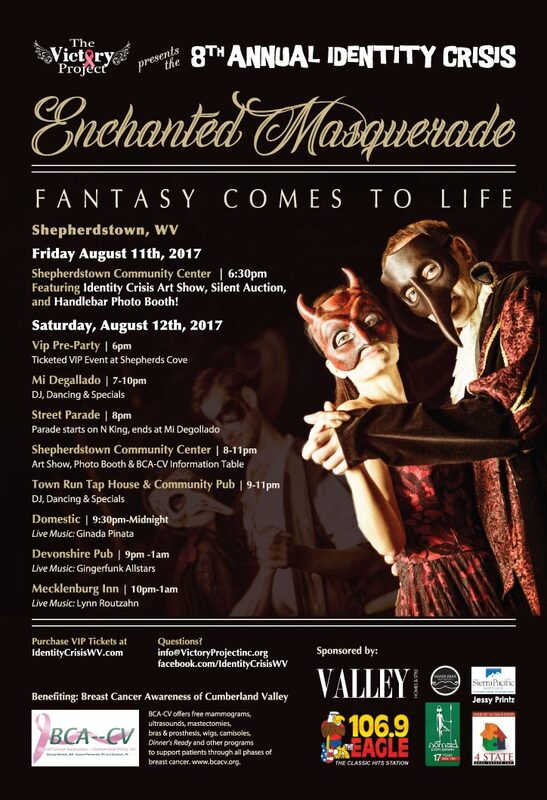 The event will take place in Historic Downtown Shepherdstown on August 12th from 6pm – midnight and includes VIP pre-party, red carpet arrival with motorcade, discounts at participating businesses, photo booth fun, dance party and more!